“Celebrity Fight Night in Italy” returned for its fifth annual event, taking philanthropic donors and special guests to Italy’s most beautiful regions, where they were treated to the very best arts, entertainment, and culture in the region. Over its 24-year history, Celebrity Fight Night has earned the title as one of the largest grossing charity events in the country, sending more than $86 million to charities, most significantly to the Muhammad Ali Parkinson Center at Barrow Neurological Institute in Phoenix, AZ. The proceeds from this year’s event will benefit the Andrea Bocelli Foundation and the Muhammad Ali Parkinson Center. On September 4th, over 100 philanthropists traveled to Italy to participate in the extraordinary philanthropic adventure, which kicked off with a memorable dinner under the stars in the Gherardesca Garden}. The following day guests were taken on a journey to the sea where they cruised along the Tyrrhenian Coast up to the stunning town of Porto Venere for a dinner at the foot of the Church of St. Peter. 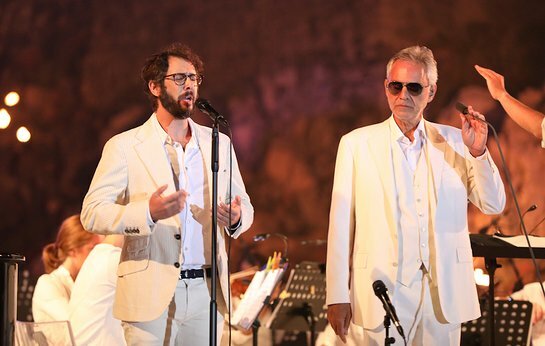 Guests were enchanted with entertainment from Andrea Bocelli, Josh Groban, Katharine McPhee, and Colin Schachat, directed by 16-time Grammy Award Winner, David Foster. The next evening, Leonardo Ferragamo hosted guests at his family house, Villa le Rose, a beautiful Renaissance villa commissioned in the 15th century. Ferragamo treated guests to a dinner accompanied with outstanding entertainment from award-winning Broadway star Kristin Chenoweth, alongside Andrea Bocelli’s son, Matteo Bocelli, Michael W. Smith, and Chris Tucker. On Saturday night, guests traveled to medieval Verona for a dinner at the Gran Guardia Palace, followed by the mesmerizing opera show, ‘La Notte di Andrea Bocelli’, in the 2000-year-old Arena di Verona. Hosted by Italian TV Presenter, Milly Carlucci, alongside celebrity presenters including Morgan Freeman, Richard Gere, and Catherine Deneuve, the show was dedicated to the highest expression of art involving over 400 performers from the world of classical music and dance. World-renowned tenor, Andrea Bocelli was joined on stage by international artists Carla Fracci, Grammy Award winner Isabel Leonard, Grammy-Nominated Aida Garifullina, Sergei Polunin, Leo Nucci, and the Italian Operatic Baritone for an unparalleled operatic spectacle. During the concert, ABF promoted the SMS Campaign dedicated to the reconstruction of the pre-school and the primary school in the Municipality of Muccia, the Central Italy Earthquake Intervention. The culmination of the 7-day event featured a fun-filled musical night led by David Foster, as well as various world-renowned artists including Andrea Bocelli, Reba McEntire, Kristin Chenoweth, Katharine McPhee, Pia Toscano, Caroline Campbell, Brian McKnight, and Michael W. Smith. The entertainment was preceded by a gourmet dinner and live auction at the Palazzo Pitti, which was built in 1457 and eventually became the primary residence of the royal Medici family. This experience was sponsored by Stefano Ricci, Antico Setificio Fiorentino, GVM, TaTaTu, Fregoli, Vhernier, Emilio Pucci, Il Palato Italiano, Falconeri, Sanlorenzo, Ca ’del Bosco, and Fratelli Piccini.